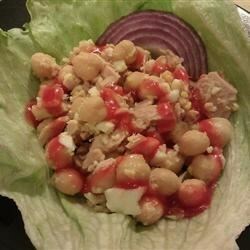 "Tuna and lettuce salad with garbanzo beans, chopped egg, and cucumber. Great with French dressing." In a large mixing bowl, combine tuna, chickpeas (garbanzo beans), chopped hard-boiled eggs, diced cucumber, and iceberg lettuce. Toss well and add French dressing to taste. This is a really good salad recipe. I used mayo instead of the french dressing and I added some garlic and onion powders just out of personal preference. Nice cool summer supper. Very yummy! I did not use cucumbers (don't like them) and added extra beans. I used red wine vinaigrette dressing and LOVED the taste combination! Thanks for the idea! This is good! I used a homemade french dressing that has lemon juice in the recipe and it really brightened up the flavor. This is a good salad! I skipped the cucumbers, as I didn't have any, but added some red onion. I actually ate it rolled up in the lettuce rather than tossed in it. Little salad burrito. Mmm. Very good and easy dish! I didn't have cucumbers so I used pickles and miracle whip instead of French dressing. I also topped it on spinach. Delicious.